the livelihood of many Greek American businesses in the Gulf Coast. NEW YORK - After the devastation of Hurricane Katrina in 2005, Daybrook Holdings and Fisheries producer Gregory Holt worked to rebuild his fishmeal and oil-producing company - which employs more than 300 people. Now, the BP Deepwater Horizon oil spill, which has been gushing since April 20, threatens what he's built. Holt, 63, whose grandfather hails from Cyprus, is among the Greek Americans and Greek Cypriots in Louisiana affected by the disaster. As the oil continues to gush, tar balls from the Mexico Gulf disaster were reported for the first time in Texas and as the onset of tropical storm season has interrupted cleanup efforts, their struggles are told against an increasingly dark backdrop. "It's hard for me to speak," said Holt about the spill, which has forced the Empire-based company's 15-man fishing boats to travel out of Breton Sound, further afield. "We are trying to find areas where it's clean," he told TNH, adding: "It's extremely hard because we have to travel great distances." No one's been laid off, he says; his employees continue to receive paychecks, but the company is "dealing with the consequences." He notes that, as with Hurricane Katrina, when the "appalling state of FEMA" was revealed, this time around, "the actual resources deployed … are severely lacking." Holt adds: "What was in place was lightweight and minimal." He said fears bureaucratic inertia with "too many cooks in the kitchen, too much procedure and not enough content." However, he said, "To be fair, I don't know if anyone envisioned an oil spill or disaster of this magnitude." As with Katrina, there's plenty of media attention, but little action. He says: "We were the company that got put on the front page of the New York Times after Katrina. We were photo of the year of WNBC." But he said the publicity didn't do them much good. He said sympathizes most with the fisherman who are in the strange position of having to work for BP, the company behind the accident, on the cleanup. Holt notes that if they lose their mortgaged fishing boats, they'll lose their mortgaged homes. "It happened to a lot of them after Katrina." Politically-active businessman and philanthropist John Georges, whose Georges Enterprises is based in Elmwood, Louisiana, echoed a similar combination of dread, but also pragmatism and resilience. "We've experienced tragedy before in New Orleans," he told TNH, speaking from Greece. He added: "So we all react by going through the grieving cycle quickly." 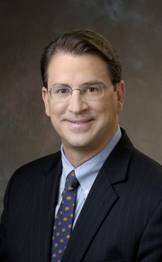 Georges, who made unsuccessful bids for Governor of Louisiana in 2007 and for Mayor of New Orleans in 2010, said considers himself lucky for getting out of the oil service sector in January. 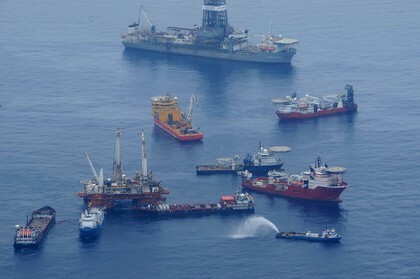 He sold his vessels, which specialized in moving oilrigs in deep water. "I sold the fleet but still have the company and facilities, which we are making available," he said. The move was made "just in time," he added. Georges Enterprises includes grocery distribution and food services, but its new restaurant concerns may be threatened. Georges recently purchased New Orleans' historic 105-year-old French/Creole restaurant Galatoire. Now, he's concerned about the loss of sanctuaries for the singularly tasty fish, scrimp, crabs, lobsters and oysters of the region; Georges noted that some "70 percent of U.S. Seafood comes from the Gulf of Mexico." He's tried seafood, such as soft-shelled crabs, from elsewhere, but, Georges says, "It doesn't taste the same." As a precautionary measure, Georges' restaurant bought six months worth of live shrimp in advance. While he said that he was pleased with Vice President Joe Biden's support of a Dutch plan for sand barriers for marsh areas, he said he was "very concerned about the use of dispersants" in the cleanup efforts. Georges knows he's not alone in his seafood worries. He estimates that some 30 Greek Americans own restaurants in the New Orleans area. Many specialize in seafood. Though the future is scary, he said, "We've become like warriors," pointing to loyalty in the region's food business amongst vendors. His family is involved in the cleanup, as his wife's family owns cleanup company Oil Mop OMI. 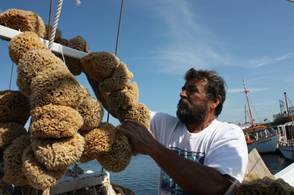 On March 24, Anastatios "Tasos" Karistinos of Tarpon Springs, Florida, was given the 2010 Florida Folk Heritage Award for his work in the sponge diving tradition. For 35 years, the Evia-born captain and diver has been navigating into Florida's waters for grueling 15-to-20-day-long sponge harvesting expeditions. Now, he said, speaking to TNH a few days before embarking on another sponge trip: "It's a scary situation really, because they didn't stop the oil yet. The oil is pushing into the Panhandle, very close to us." He anticipates that sponge divers will face the limitations that fisherman face, as the oil approaches, but also slowly rises from its 5,000 feet depths. "Sponges filter water," he explained. "If the oil comes here, it'll be hard for us." He too noted that the marine creatures he specializes in will die if they imbibe the tiny droplets of oil treated with dissolvents. Sponge divers have only to monitor the Fishery Commission's computer maps of restricted areas to see that 80 miles from Tarpon Springs has already become off limits. Karistinos believes the damage is underreported. "It is a lot more than they say," he said. Nonetheless, the name of his ship speaks of optimism in ecologically dark times. The 17-foot Greek style sponge fishing vessel is called Anastasi, for Resurrection. It's a name it shares with its owner, his son and his grandfather before them.